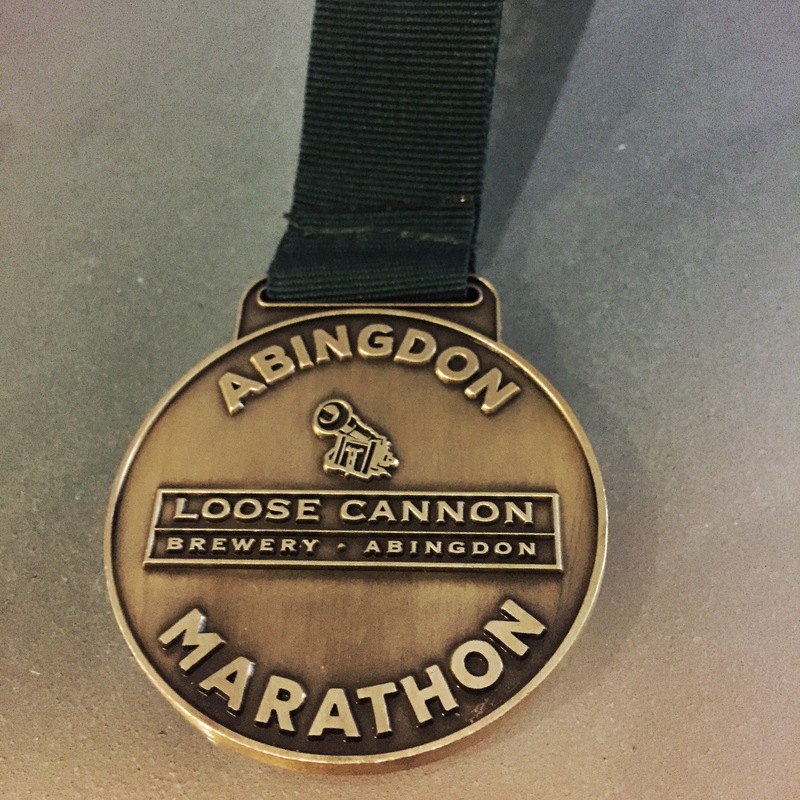 Last Sunday, I ran the Abingdon Marathon, a race that I had nearly given up on due to my glute injury. My preparation was really rushed – by the time I realised I would be fit to run, I had just six weeks to increase the mileage. I was wary about getting injured again so I added distance very cautiously. As a result my longest run before this marathon was only 16 miles – just over half the marathon distance. Given the lack of endurance training, I had in my mind that this would be a training run and there was very little chance I would get a PB. The weather forecast looked atrocious – Storm Brian was forecast to batter Britain over the weekend with heavy rain and gale-force winds, but I’ve run into work in the rain before so that didn’t bother me. What did bother me was a phone call we got on our drive to Abingdon telling us that the hotel we were driving to was out of power. That wasn’t a problem, I thought, and I quickly made another hotel booking in the area. But then things quickly took a turn for the worse – our car broke down. 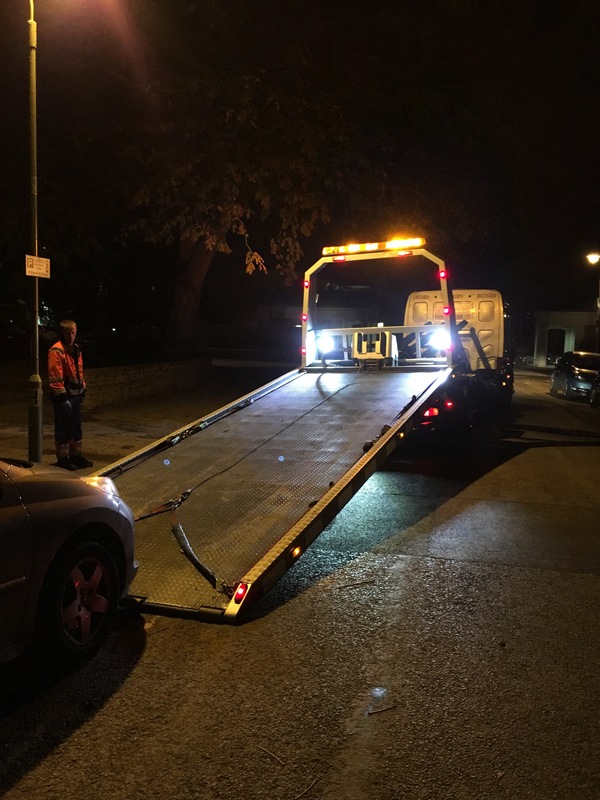 We called for emergency breakdown services, but they couldn’t fix the problem and the car had to be towed away. The silver lining was that we were only a couple of miles away from Abingdon so we were at least able to get towed to the hotel. The following morning, we left the hotel at ridiculous o’clock knowing that queuing for the toilets before the race was pretty much inevitable and that we would probably have to queue for the race numbers too. 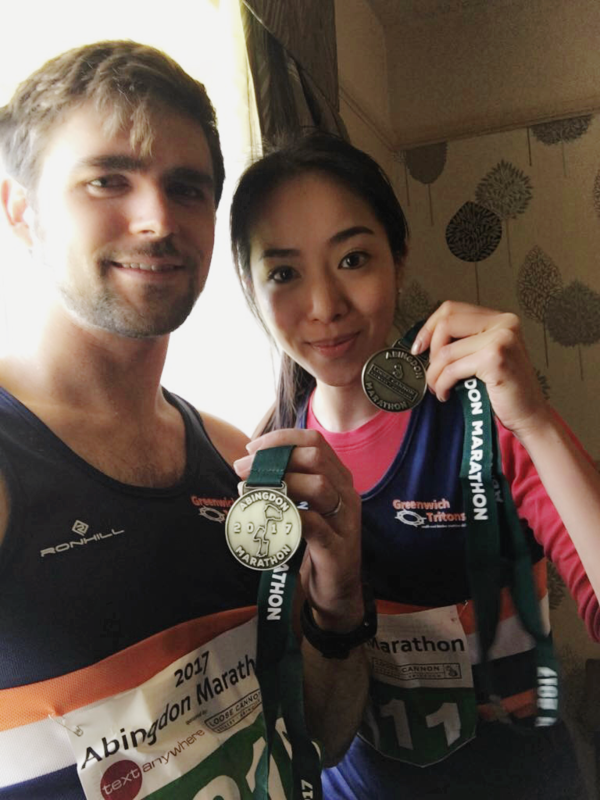 As it happened, there was no queue at the info desk and we quickly picked up our numbers – which was great, as it left us plenty of time to get ready and get to the start line. It was pretty chilly and windy so in the end I decided to wear a long sleeve top underneath my Greenwich Tritons top. Clinton was aiming for a sub 3:30 time and my aim was a more modest sub 3:45. Although neither of us said it, we both wanted to do as well as we could. In Clinton’s case, it was about proving to himself that he could do better than his previous time at the London Marathon earlier this year. As for me, I had no real idea what was going to happen. There was a real possibility that I would blow up some time after 25km. I knew I had a good base of fitness, but I wasn’t so sure about my muscles and stamina over such a long distance. The starting gun was fired at exactly 9am and we were off. It was a fast field so in the first ten minutes I found myself being dragged along by the other runners. I settled into a 5:00/km pace and for the first few miles ran with a group of runners who were all aiming for 3.30-3.45. It was good to be running with a group and the pace was very comfortably within my range. I remembered feeling some slight discomfort in my left hamstring, but it didn’t last long and soon disappeared. Probably race day nerves! Over the next few miles, I got in to a couple of conversations with other runners. The distraction was very welcome and the miles passed in a flash. But then suddenly I heard a thud noise. I quickly checked my race belt. “Yeah that was your gel,” another runner said. Thankfully that was my spare so didn’t let it faze me but I knew I couldn’t afford to lose any more gels. I became very paranoid after that and kept checking my belt every ten minutes to make sure all my gels were still properly tied to my belt. Because I didn’t run with a hydration pack, I became very concerned with hydration and had to drink at every water station. I found it really difficult to drink from the plastic cups that were handed out – naturally it was impossible to take a huge volume of water in at one time without coughing and spluttering! I learned that the trick is to tip out half of it, squeeze the cup in the middle to make a spout and just sip a couple of mouthfuls. If it’s juice, turn sideways, so when the juice tips out, it doesn’t go all sticky down the top! The crowds in Abingdon were absolutely fantastic, seemingly every resident had turned out, and they were really making some noise. Someone was holding up a sign “Don’t trust a fart at mile 20”, which really made me laugh. The cheering from the spectators helped immensely. Before I knew it I was approaching the half way point, and I spotted a man wearing the stripey Highgate Harriers vest. It was Greg! It was a boost seeing a friendly face and we stuck together for a bit. At this point I was really focusing on form and technique. The pace still felt easy. I had no aches or pains so I knew it would be some time before I slow down. It seemed like I was running into the winds the entire race. Before the race I was hoping to get into a group so I’d be able to do a bit of drafting and shelter from the wind, but that didn’t happen. As I passed the 18-mile mark, I realised that my pace was still strong so I decided to pull away. 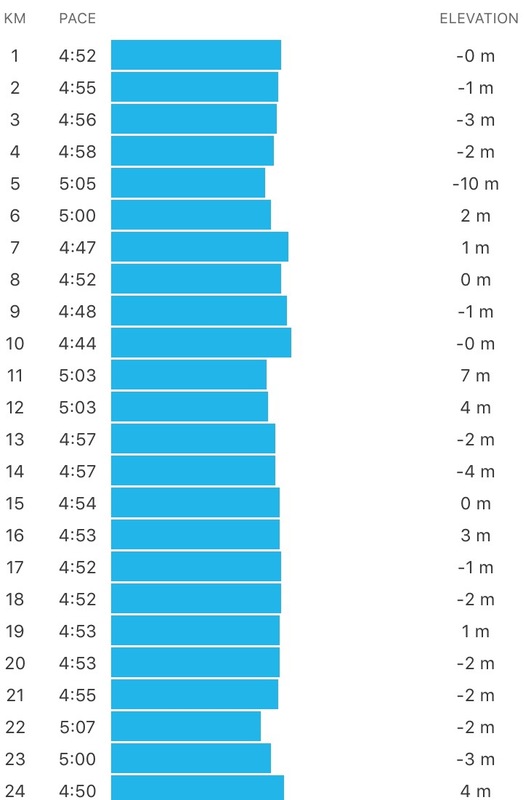 That was when I realised I was actually doing negative splits – averaging 4:50/km! I tried to do a few mental calculations to work out what my time would be if I carried on at this pace – but I couldn’t really do the maths, so I decided to stop thinking so much about it! At the 20-mile marker I tried to imagine myself running as fast as Paula Radcliffe (we can all dream). My hamstrings felt tight but I knew I had more in me. I was surprised to see that my pace increased to 4:45/km – which wasn’t far off my old 5K pace! Could I make 3h30? Yes if I could hold it. And that would be a PB by three minutes! At the 22-mile marker I was starting to struggle. “5k to go! Just 5k!” I shouted to the other guy next to me – also a reminder to myself. It was a fatal thought because 5K seemed easy, and I needed to run hard! How often have I run 5K? Dozens and dozens of times, but few as painful as this. On the final trudge towards the finish I had to go through a subway at the 25 mile mark and had to run up a ramp. I tried to speed up – if I slowed down there was no way I’d get going again. I crossed the line in 3 hours 25 minutes and 31 seconds – which was 8 minutes faster than my last marathon! It just goes to show the power of the mind and a decent crowd. Clinton was waiting for me at the finish and he congratulated me. We had both smashed our expectations and what’s more, Clinton had shaved an hour off his PB with an incredible time of 3.22! I finished 12th in my age group (26th female overall) in 03:25:31, out of the 751 runners who completed the course – giving me a Boston qualifying time! 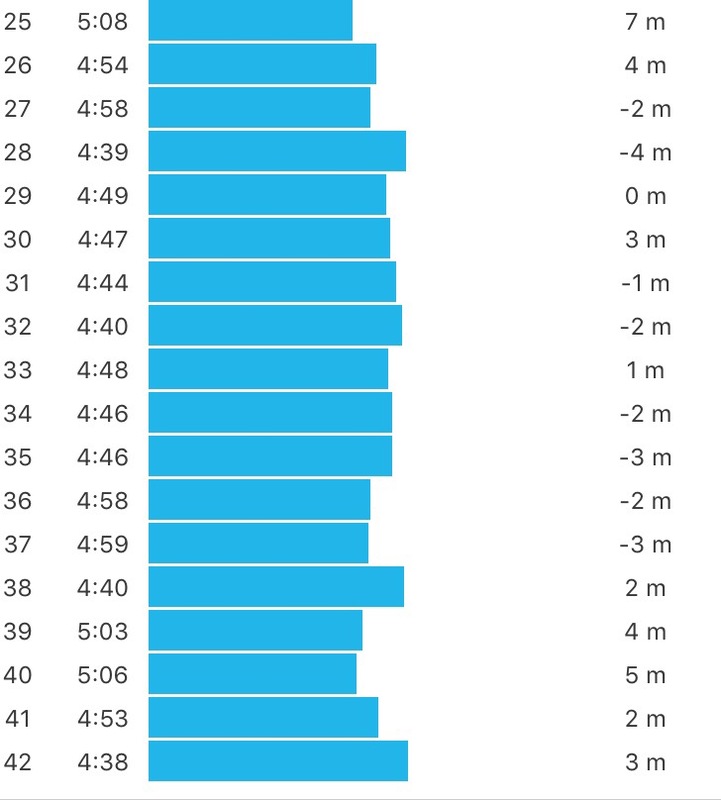 If anyone offered me a sub 3:30 time before the race I would have laughed it off, but ridiculously my expectations had changed during the race. This is what makes these races so interesting – they always give us a chance to prove something to ourselves – to prove that we can be better and go further! The rest of the day was spent eating, travelling back to London, and trying not to hobble around too ridiculously. It was a real pain to get back, since our car broke down and we had to get the train back down to London. Not ideal after you’ve run a marathon! The biggest thing I’ve learned from this marathon is simply not to limit myself. I’m so grateful to have people around me supporting my goals from all angles, helping me prepare and execute on race day, mentally prepping me and bolstering my confidence and insisting on my capabilities. 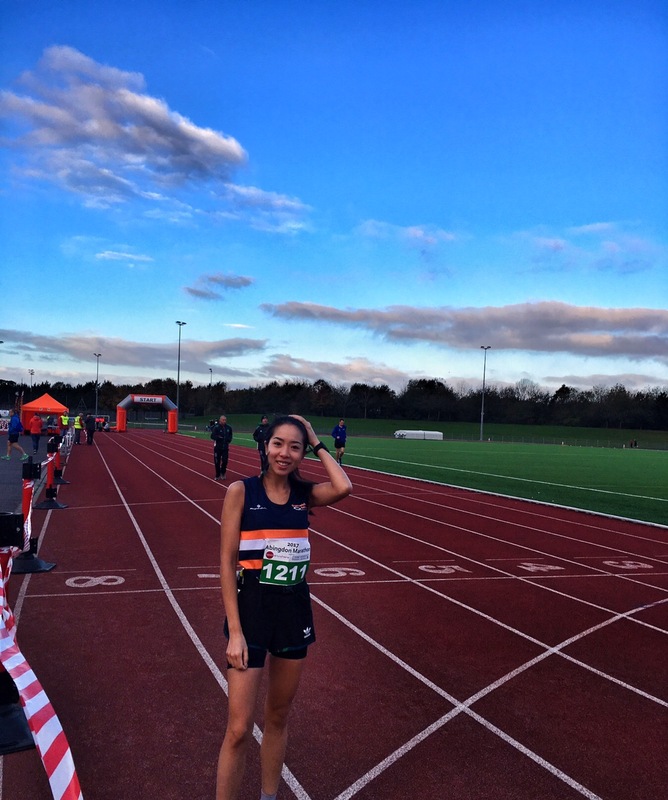 This is a really big achievement for me and I’m a lucky girl to have all the positive supporters in my life – thank you to all of you at HHPR, Highgate Harriers and Greenwich Tritons! 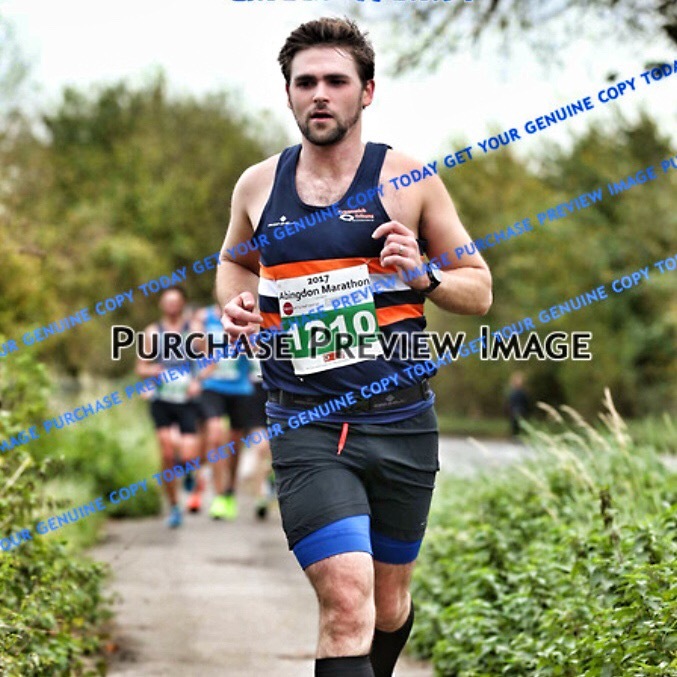 Abingdon Marathon! Or as I’ve started calling it, my redemption marathon. Redemption from the London Marathon where I finished in 4h26mins far behind Jess and my target pace. The day before was less than ideal. To cut a long story short, the car broke down and we had to get towed to the hotel. The next morning, we woke as the light was creeping over the horizon – crisp, bright and clear – the perfect running weather. Perhaps our luck was turning. It was a few miles to the start and without a car we had to taxi over to the race track that doubled as start and finish line. We dropped our bags and picked up our numbers before making our way to the start, it was a bit cold forcing Jess to put on an extra base layer last minute. I dodged a buggy at the start so I wouldn’t trip over it and found a space a few rows back from the front. Then we were off and the pace was immediately quite fast! Nothing like London where I’d slowly ambled over the line with thousands of others. I’d set my watch to vibrate if I was running too fast (sub 4.40/km) or too slow (5/km) and it vibrated a lot on those first few kms! Too fast! I was averaging 4.35/km. I was having flashbacks to London where I’d totally crashed and burned but I knew my training was much better this time and I was feeling great. A hord of faster runners quickly disappeared into the distance as the route led almost single file through an off-road path. This was probably one of the nicest parts of the route as the rest was all on concrete pavement or roads. Within 1km, I had dropped two of my gels – nightmare! I’d been planning nutrition carefully and decided to have 1 gel every 30 mins throughout the race, occasionally having Clif bar blocks and I’d even got a solid Clif bar energy bar, just in case. That plan was ruined as I was left with two gels, one roll of blocks and the bar. I adopted a “one every 45 min” approach and just hoped that would be enough. My trouble started when I had about 7km to go, my watch that had been so happily telling me I was going too fast was now gleefully telling me I was going too slow! There is a point in my data where you can see my stride shortening, my ground contact time increasing and my pace slowing – at 35 km exactly! With 3km to go I was floundering. My pace was now 6min/km but I had to finish. 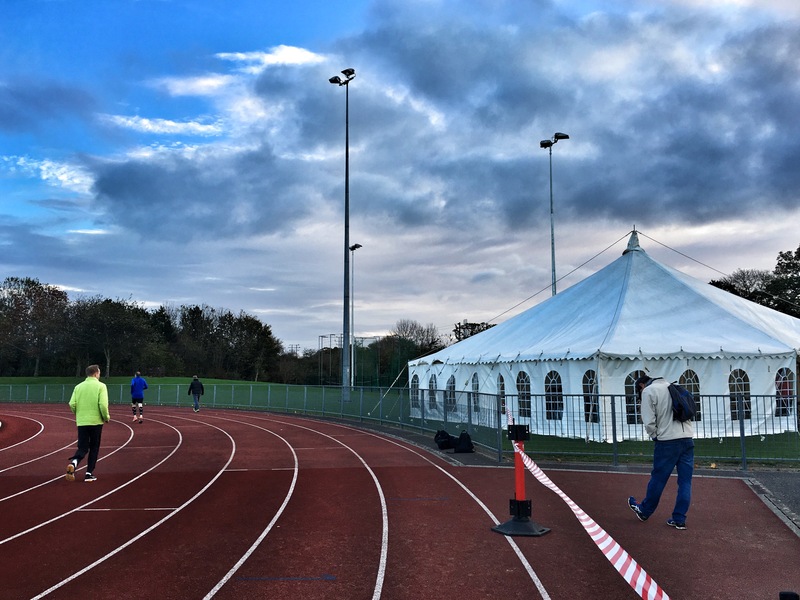 I finally made it back to the track and after one laborious lap I crossed the line – I was knackered! Honestly I’d never felt such pain – like an inescapable ache that you can’t stretch out, you can’t walk off, I laid down and put my feet over my head for temporary relief. Hang on! Isn’t that Jess!? I thought as she finished her lap, only a couple of minutes behind me. She’d smashed her PB as well! I was so happy I managed to stay just ahead in those final few kilometres! Had the race been any longer, she would have caught me for sure! I’d smashed my London time to bits! I’d ran a whole hour faster! I finished in 3h22m, faster than London by over an hour! Next Next post: Taking the plunge – taking up open water swimming and signing up for an Ironman 70.3!